Christian Web Host Review 2019: Is Christian Web Host a Good Hosting? Christian Web Host provides a range of shared web and VPS hosting solutions for customers with Christian values. Their modern products provide powerful features and security via software partners and server providers. This St. Petersburg, Florida company was founded in 1997 to provide high-quality web hosting on the best infrastructure in a way that didn’t compromise their Christian values. Their servers run on cutting-edge PowerEdge server hardware located in Expedient Communications’ premium facilities. VM Software: Partnering with popular VM software providers such as Virtuozzo, VMware, and Veeam Backup Recovery. Since CMS-specific hosting is not provided, you’ll need a bit more know-how to install what you need via cPanel+Softaculous for web hosting and SolusVM for VPS hosting. Fortunately everything else – from their pricing structures to the signup and purchasing process – is very straightforward. The starting prices for these products are on the high side. Although you get generous resource allowances and a very polished platform, you don’t get absolutely everything you need, and the necessary extra security is not exactly cheap. Christian Web Host provides 24/7 technical support via a ticketing system, plus phone support within office hours on weekdays. Response times via these routes are superb, although email response times can be somewhat variable. Support staff are knowledgeable and courteous when dealing with common issues, and the knowledge base is decent enough if you’re more into DIY solutions. If you fall within the target client base of customers wanting excellent shared web or VPS hosting aligned to Christian values, then the clue is in the name and you can’t go wrong with Christian Web Host. Be prepared to pay slightly higher prices for these principles combined with great support and ease-of-use. 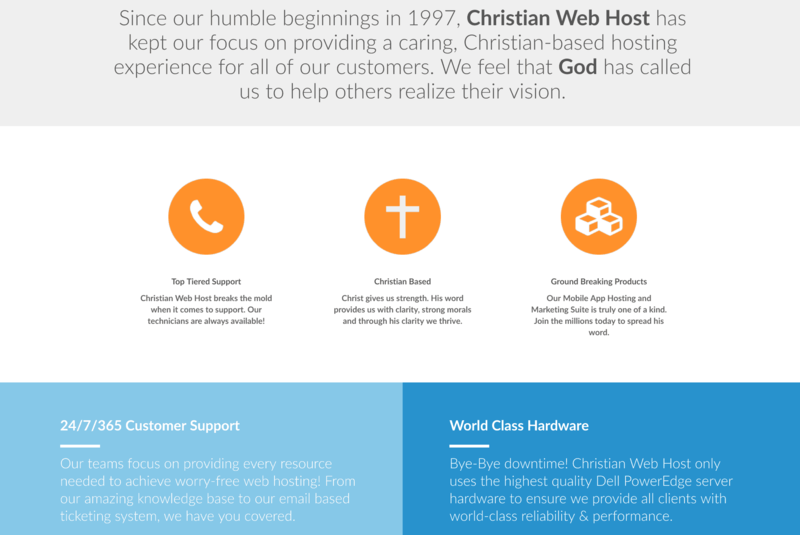 Wondering how Christian Web Host stacks up against other Web Hosting companies? Enter any other Web Hosting company and we will give you a side-by-side comparison.